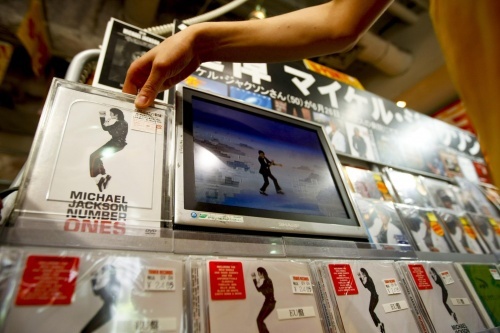 Michael Jackson, the king of pop, who died suddenly on Thursday has reached the top 15 slots on online retailer Amazon.com Inc's best-selling albums within hours. The No. 1 disc was the 25th anniversary reissue of his 1982 blockbuster "Thriller," the biggest selling album in history with estimated worldwide sales of almost 50 million copies. Three different configurations of "Thriller" came in at number 12, 13, and 14. The second place went to 1979's "Off the Wall," which was followed by 1987's "Bad." Jackson's last studio album, 2001's "Invincible," came in at a more modest No. 10. The other albums on the list were mostly compilations either of his solo work or his hits with the Jackson 5. Jackson's Sony Music label, a unit of Sony Corp (6758.T) (SNE.N), said he sold an estimated 750 million records worldwide, and released 13 No. 1 singles. "His artistry and magnetism changed the music landscape forever," Sony Corp Chairman, CEO and President Sir Howard Stringer said in a statement. "We have been profoundly affected by his originality, creativity and amazing body of work."